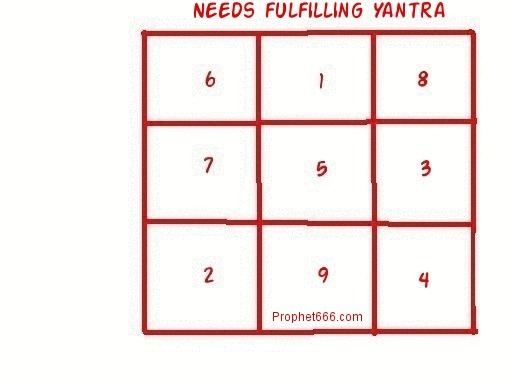 A simple all needs fulfilling Yantra; requires no complicated mantra Siddhi; suitable for the layman. 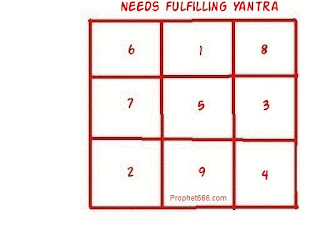 This Yantra is known to fulfill all needs required for a contented existence. The Yantra has to be written just like how I have prepared it. On a white piece of paper with red ink. Then it has to be stuck on the inside of the main door of your home. Then another similar Yantra has to be prepared and it has to be kept in your purse or wallet. Then if you are going to meet someone seeking help related to the fulfillment of your needs chant the mantra – Om Hreem Namah ॐ ह्रीं नमः as many times as possible on the way and before meeting him. Does the yantra need to be worshipped or energized in certain way before actual use? Please kindly reply. Thanks a lot. Yes you can use the Yantra in that manner. Sir the Yantra should be facing inside the house or outside while hanging at the door. The Yantra has to be fixed on the inside of the main door and facing inside. It has been mentioned in the post that the Yantra has to be written with red pen on plain paper. Is there any necessity to paste the same on door. In my country, many switch and sorcerers often write the Spells on Yellow piece of paper. So, I wish to know if I can write on yellow piece of paper and it works well as white plain piece of paper ? It will work on white or yellow paper. that should be no problem. Dear nil ji, can I prepare this yantra anytime , any day ? Hello Guys, read the post carefully before asking questions. They have mentioned it very clearly and in simple words. Sir this is similar to Lo SHu Magic square published on 7th June 2012. Thanks guruji for uplifting my being. This mantra also strengthens our confidence. dear Neel sir we can paste it inside the door? and another 1 can i laminate and keep in my wallet?